It’s like the hatchback of synths – the compact, mid-range priced synth that might just wind up being everyone’s favorite. It’s poised to be the Golf GTI of electronic instruments. To be honest, I loved the original of this series, the minilogue. But then with each new iteration, KORG added something new that made me want a combination of all the other synths. And now, sure enough, what do we get? A combination of all the other synths. From the minilogue: the elegant 4-voice polyphonic voice structure and voice modes that made the original so terrific. And you get the portable 3-octave for factor of the original, as well. Overall the combination of features and form factor will mean for many people this is the perfect KORG synth. The new architecture: 2VCO + MULTI ENGINE, 1VCF, 2EG, 1VCA, and 1LFO. That’s three oscillators plus filter drive – and new effects, features, and the ability to download even more from the Internet. So the xd easily bests the mini- and monologue before it. More oscillator goodness. The multi-engine is something we first saw on the prologue flagship. It gives you a noise generator, a rich and edgy “variable phase modulation” and FM oscillator, and then the ability to load your own user oscillators. There’s a morphing wavetable to get you started, but you can go download more online. More effects. The effects side is deep, too – stack modulation effects, reverb, and delay together, with chorus, ensemble, tape delay, and various reverb flavors pre-loaded. Plus as with the prologue, you can load your own custom programs – including third-party developer extensions. Tons of voice mode options. Part of the original appeal of the minilogue was its various voice modes, offering lots of creative options. Stereo output, 3 effects at once. You get stereo output, too… and you can layer as many as three effects simultaneously, which bests even the top-of-range prologue (which can do two at once, albeit with of course more voices). 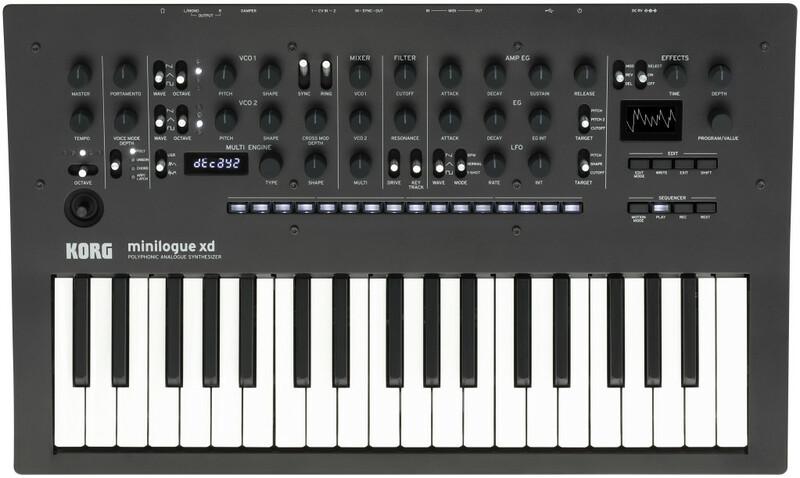 – POLY: The minilogue xd operates as a four-voice polyphonic synth. – UNISON: The unit operates as a monophonic synth, with the four voices working in unison. – CHORD: Chords are produced using one to four voices. – ARP / LATCH: (ARP) Provides an arpeggiator with up to four voices that can also be used while the sequencer is running / (LATCH) Switches latch on or off. – POLY: Turning the knob toward the right switches to DUO mode and deepens the detune. – UNISON: Turning the knob toward the right deepens the detune. – CHORD: Selects mono or chord type. – ARP / LATCH: (ARP) Selects the arpeggiator type. The mono mode isn’t quite like what you got on the minilogue – chord mode when you have depth set to mono means essentially just one note, with legato and portamento. But the original minilogue and prologue still have an advantage here – 1- and 2-octave layering in mono mode. Voice mode depth was on the original minilogue, too – you do still miss out on some of those modes (like sidechain), but the important ones are here. The poly/duo trick here is inherited from the prologue. The first minilogue therefore retains some of its estoeric worth. But I think what’s worth noting here, though, is the architecture is deeper in every other way – and the new prologue oscillators have a richer timbral range – even before you get to all those new effects, microtuning, and software expandability. Plus a new joystick. One thing we perhaps won’t miss from the original minilogue and monologue is the weird paddle-style pitch/mod fader. There’s a new compact joystick to handle pitch and modulation as X/Y; we’ll have to see how that feels, but it at least saves space. And CV. Also new: two CV inputs for those wanting to interface with other analog gear.